I have been reading the book “Creating Money” by Sanaya Roman and Duane Packer. It’s a great book and I’m learning a lot. I highly recommend it! But there is still a part of me that is resisting the paradigm shift; resisting giving myself the full permission to do what I love. I am even ok with accepting another part time job or even better, a business opportunity while I continue building my practice as an Energy Healer. But I feel quite stuck in my current part time job. I have applied to a few other jobs but nothing seemed to feel quite right or have the pay rate I was looking for. I discovered that there is a Thai Massage class being held in OCNJ during the week when my family will be there. It is $800 for a 50 hour training. This more than the amount of money I typically make in two weeks currently. But I was so excited when I saw the class listing. I am letting it soak in to determine whether it was a passing excitement or a sign from my higher self to follow through and sign up for the class. As of right now, I really feel called to do it! I just mentioned it to my manager to request off for that week. I just got off the phone with a patron that stayed on the phone for 45 minutes. I was very patient but near the end I had to show a little bit of impatience in my voice. He was an older man asking various questions about the free concerts this weekend. During the phone call, I closed my eyes and I could feel something happening in my psyche. It made me wish that I could send him healing energy and have a genuine conversation with him. Since I am here at the call center, I have to stick to the guidelines of giving out information regarding the tickets and performances. It’s funny because the Training Manager always says “hide your script” and “just be you.” Obviously I can’t just be me! But I’m not complaining. Lately I have also thinking about my ego. Of course I believe that we need to have an ego to promote and differentiate ourselves in this world. But the key is to have it balanced. 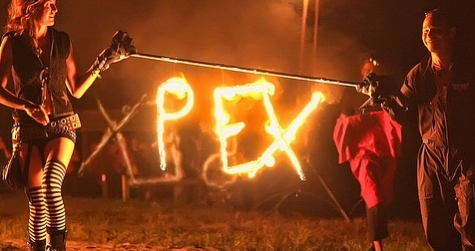 I’m off to PEX Summer Festival for the 3rd year in a row! I will keep you updated on my experience when I get back on Monday! Mantra for the weekend: I love my life! The theme I’ve been recognizing this past week is denial vs. acceptance. In this video by Ralph Smart (Infinite Waters Diving Deep), he says that the first step to Stop Caring What Other People Think is to stop pretending that you don’t care what anyone else thinks. This really stood out to me, as lately I tend to adopt an attitude of “anything is possible” and “it will all work out perfectly”. While I do believe that the Universe is always conspiring to help me, I can’t always have a happy go lucky attitude and expect all of the work to be done for me. Back to the idea of denial vs. acceptance… When I was in yoga class at Studio 34 yesterday, I was feeling a bit sore and frazzled and stressed from moving. And I could feel the soreness on my right side of my body, which fluctuates depending on how I sleep and my stress levels. ( I can’t wait to have my bed and more eclectic furniture in our beautiful West Philly home of healers and yogis.) The teacher, which I first met at a Yoga Sound Journey night at Sera Phi, was taking the class very slowly. This gave me time to draw inwards and really be conscious of my body. The way I have been relating to my body has been changing a lot lately. There are times where I almost feel like I am not even in my body! But I also love my body and I’m very excited to start living a healthy lifestyle with plenty of superfood smoothies, bananas and herbs! I realized that we become like the people we surround ourselves with, that’s why I chose to move in with two beautiful goddesses that live conscious lifestyles. One has brought a Berkey filter, to filter our fluoride & more from out tap water. She also placed a shungite crystal inside of the filter to energize our water. I am so grateful and excited for this year ahead of me. Anyway, I noticed that along with my optimism and ability to envision the future, I may sometimes forego the present moment. In the yoga class, I was really able to just sit with myself and talk to my body and tell it that “it’s ok that you have pain, you don’t have to be perfect”. I also was inspired to start talking to myself because of an article in Wisdom magazine, along with this video interview of Danielle LaPorte, author of The Desire Map. The article in Wisdom is called Your Cells are Listening: How Talking To Your Body Helps you Heal. When we see people talking to themselves on the street, we assume they are either using a wireless earphone or they are crazy! Well, maybe my new technique should be to just buy a wireless earpiece so that I can talk to myself. Or I can watch Ralph Smart’s video and let go of what other people think of me! As he mentions, we will always care to some degree, but we shouldn’t let it affect our decisions. Also going along those lines is resistance. I realize that the more I resist things, the more power that gives them. The more I focus on something else, that can raise my vibration. Anyway, once I started to accept my pain, it seemed to dissipate, moving me towards my desired outcome. So I’m going to work on doing this in all other areas of my life as well! Accept where I am, as it’s exactly where I need to be. I do know that when I am at events like PEX Summer Festival, Symbiosis Gathering and Burning Man, I can be myself times infinity. (I haven’t been to Burning Man yet, but I am planning on going this year and camping with the HeeBeeGeeBee Healers and I couldn’t be more excited!) Today during my session with Angela, I realized that one of the things I love talking about the most is Burning Man, or anything else related to Burner culture or transformational music festivals. I realized that I am a Transformational Leader!